On the evening of Monday June 1st, I had the opportunity to attend a mass Blanket Exercise on Parliament Hill, organized by the Assembly of Seven Generations as part of the closing of the Truth and Reconciliation Commission of Canada (TRC). 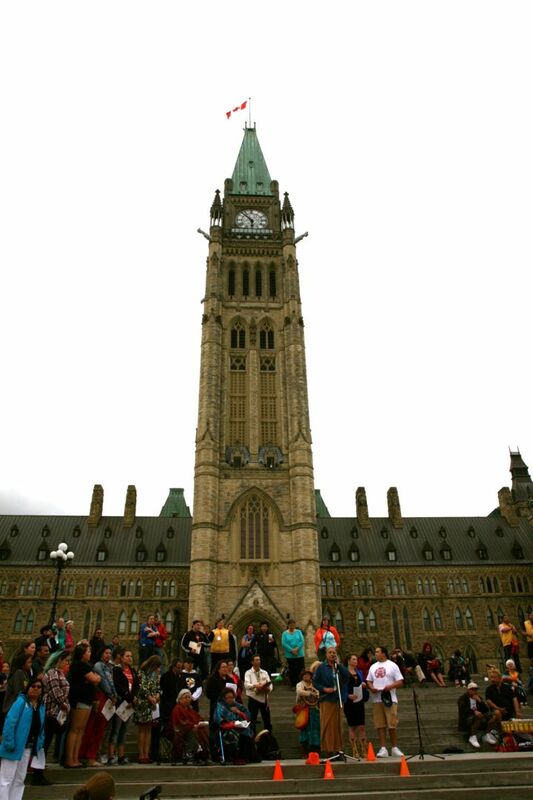 The event opened with an Ojibwe prayer song by an elder of the community, her hauntingly beautiful melodies echoing across the Parliament buildings and the downtown Ottawa core. 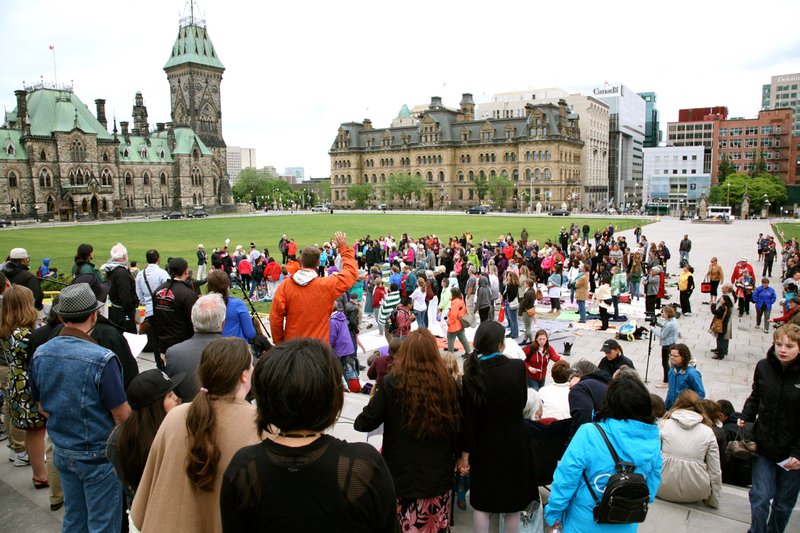 Blankets were arranged at the foot of the steps leading to Canadian Parliament, representing Turtle Island, the land we now know as Canada. 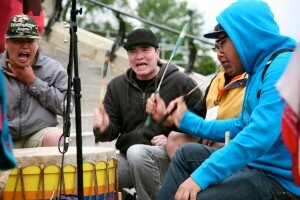 Participants were encouraged to step into the roles of First Nations, Inuit and later Métis peoples. Over the course of the next hour, we were led through the history of Indigenous people in Canada, a history that is rarely taught in full in Canadian classrooms, spanning from the arrival of European colonists to the present day. To begin, the multicoloured blankets were lined up neatly, side by side. As the exercise progressed, blankets were separated from one another by individuals taking on the role of European colonists, dividing the lands in various steps. During this stage some participants jokingly realigned the blankets after they were divided, only to have the European role player come by to once again divide the blankets, the irony of which was not lost on those nearby. At one point, selected participants, myself included, were handed white cards. These cards symbolized our having contracted and succumbed to smallpox, and we were asked to leave the blankets to observe the rest of the exercise from the assembly on the steps. The blanketed area was further reduced as blankets were folded and folded again, a stark picture of the shrinking Indigenous land, until meagre squares remained, symbolic of modern reservations. 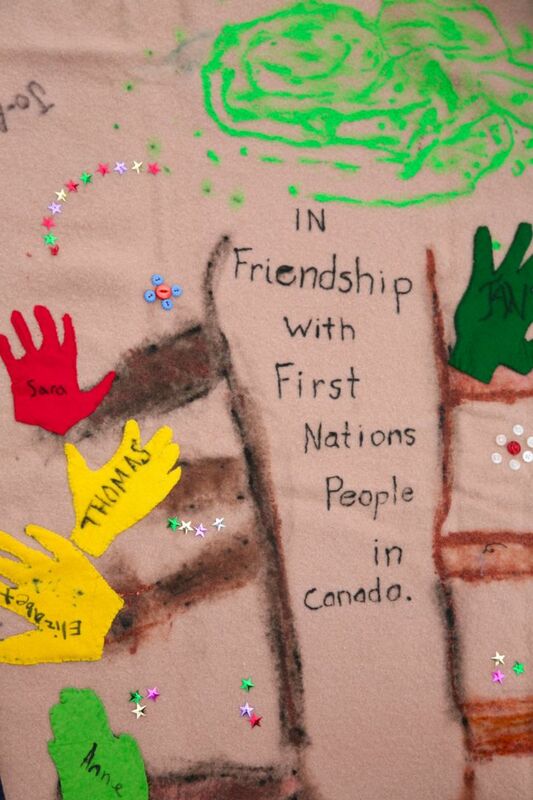 At key points throughout the exercise narrative scrolls were read aloud, voicing an array of thoughts and testimonies of members of the First Nations, from school children to political activists. 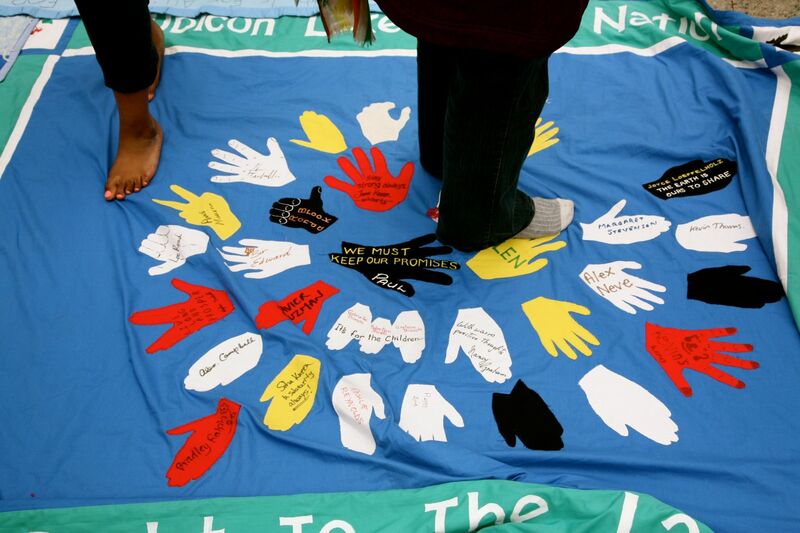 Later in the activity, selected participants were given yellow cards, inviting them to play the role of aboriginal children taken from their families to be put in the residential school system, represented by a small blanket far from the group of blankets. A song began, sung in memory of all of those children, and their respective communities, who were so deeply impacted by the horrors of the residential schools. Local group Ottawa River Singers provided the rhythm and melodies of a healing song as a jingle dress dancer performed in a heart-wrenching tribute. We were then encouraged to give our friends a long hug, holding one another in reflection that we are all one people under our Creator. Tissues used to wipe away tears were collected, to be thrown into the Sacred Fire, burning since May 31st, on Victoria Island. 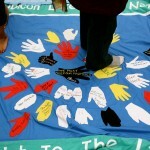 At the Sentinel Project we aim not only to prevent atrocities with the potential to escalate to genocide, including cultural genocide, but also to commemorate the victims of genocide, honouring their lives as well as the lives of the heroes that have broken the cycles of oppression and injustice. It was a privilege for me to be part of this historic event in our nation’s capital. 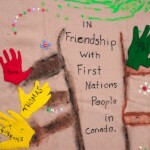 It is the Sentinel Project’s hope that the process of reconciliation moves now from apology to action, and that the recommendations provided by the TRC, including new and revised legislation for education, child welfare, and aboriginal languages, be formulated and implemented promptly. 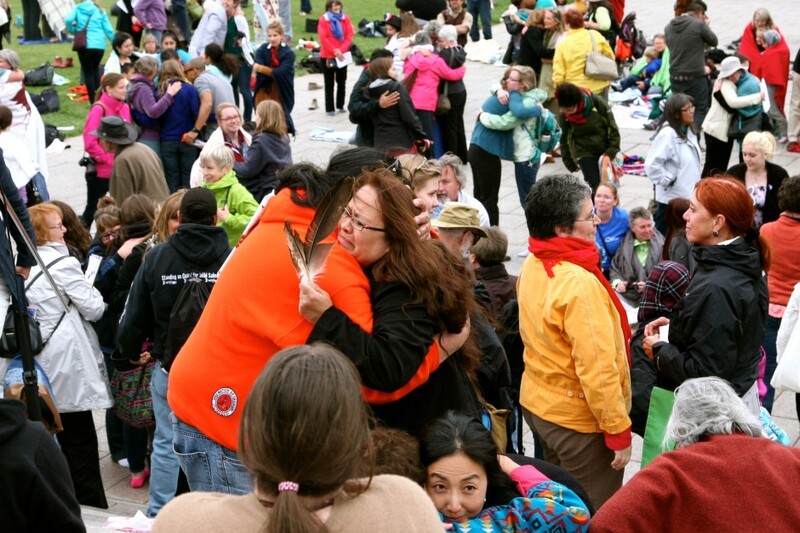 The closing events of the Truth and Reconciliation Commission of Canada have come to an end, but true reconciliation and meaningful healing go well beyond a government-sanctioned commission. It is up to ordinary Canadians and our society at large to acknowledge and commemorate this painful blemish on our history, and to honour our Indigenous peoples and restore relations between them and non-Indigenous peoples. This notion became apparent to everyone in attendance as the Blanket Exercise ended in a jubilant Rounddance to the driving rhythms of the Ottawa River Singers. 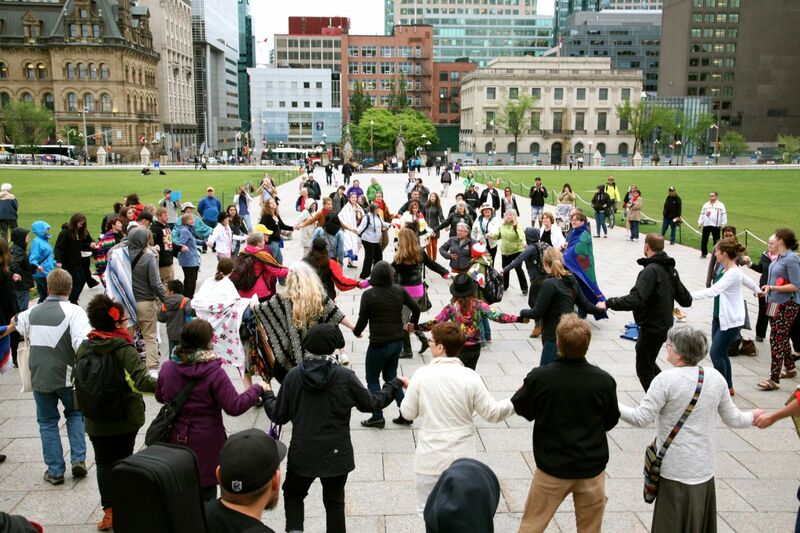 Indigenous and non-Indigenous people danced hand-in-hand at the foot of Canadian Parliament, a testimony to the conviction that the only way forward is together.